Join the discussion on our forums! Come discuss Walnut Sprite over in our dedicated Walnut Sprite discussion topic. How do you make a walnut laugh? Crack it up! Not exactly amazing now, but may be scarier in future expansions if we get something along the lines of "Battlecry: The first Echo minion you play this turn costs 1 mana"
in the meantime, I will continue to spread the word of the ridiculous and hilarious Nutlock build. 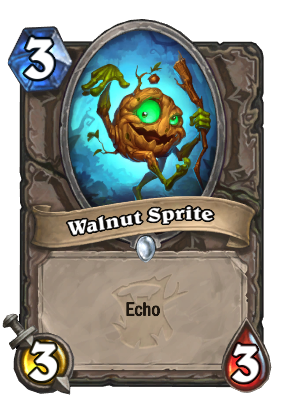 If Paladin could pull off what Warlock is pulling off with this little guy right now, Walnut Sprite would be terrifying. Summoning POrtal into easy board. CAn we make Nutlock a thing please? Now you can literally draw "the nuts." In the preview video, when Ben Brode and the the other two (whose names I can't remember offhand) were running off shouting how the card they saw was "too OP", everyone assumed it was Hagatha. The most annoying stat line on echo minion from all possible ones. Good. It will crush some nuts. Why would Blizzard print this? This card is NUTS! Can only imagine its quotes.